It is believed that Catholics were present in Brighton as early as the American Revolution, serving in either the Continental Army or working in the cattle industry or on the area’s farms. During the 1840s and 1850s, care for Brighton’s Catholics became the pastoral responsibility, first, of Fr. Patrick Flood (Pastor of St. Mary’s Parish in Waltham) and, later, of Fr. Michael O’Beirne (Pastor of St. Mary’s in Brookline). As a mission territory of St. Mary’s in Brookline, Brighton did not have its own church until 1855, before which time Confessions in Brighton were heard in private homes and Masses in Brighton were held in the loft of a barn that had been located on Chestnut Hill Avenue. Fr. Joseph Finnoti, who had been put in charge of St. Mary’s Parish and its Brighton mission by Fr. O’Beirne, built Brighton’s first Catholic Church on Bennett Street. In honor of his congregation’s Irish heritage, Fr. Finnoti named the new church “St. Columba’s.” Built in 1855 as a wood structure, this church’s existence would be short-lived; in 1862, it burned to the ground due to a “defect in the position of the heating apparatus.” Until a new church was to be built on the same plot in 1863, Sunday Masses were held in the basement of Town Hall. By 1871, the size of Brighton’s Catholic population had grown dramatically, and so on July 1, 1871 Archbishop Williams made “St. Columba” its own parish. Fr. Patrick J. Rogers, who, as the new Pastor, changed the name of parish to “St. Columbkille”, replaced Fr. Finnoti as Pastor, whose health had declined. Upon Fr. Roger’s death in 1882, Father Anthony Rossi became St. Columbkille’s 3rd Pastor. Among his many accomplishments as Pastor of Brighton was the founding and construction of the St. Columbkille School, now the St. Columbkille Partnership School, which accepted its first students in 1901. Fr. Rossi died in 1907; a week after his death, the Boston Globe reported that Fr. Rossi had been “one of the most powerful forces for public good [in Brighton]. Msgr. Joseph Tracy, who in 1908 oversaw the graduation of the first class of St. Columbkille School, succeeded him as St. Columbkille’s 4th Pastor. Among his many accomplishments during his pastorate, Msgr. Tracy built the current rectory and oversaw vast architectural and aesthetic improvements to St. Columbkille’s, which would be continued by Msgr. William J. Daly who, having been a member of the St. Columbkille School Class of 1909, became St. Columbkille’s 5th Pastor upon Fr. Tracy’s death in 1947. Following a term as the Rector of St. John’s Seminary, in 1965 upon the death of Msgr. Daly, Msgr. Stapleton became St. Columbkille’s 6th pastor. He served as pastor until Fr. Joseph Sheehy, who also served as the Catholic Chaplain at St. Elizabeth’s Hospital, became St. Columbkille’s 7th Pastor. In 1990, Fr. Richard Shmaruk succeeded Fr. Sheehy as Pastor, becoming St. Columbkille’s 8th pastor. 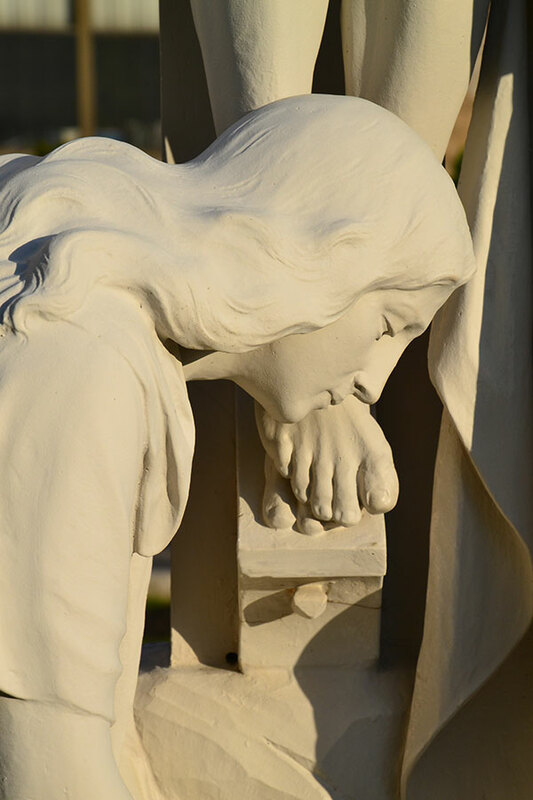 During the next decade and a half, significant changes would once again occur in Catholic Brighton. 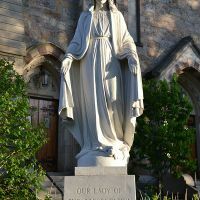 In August of 2004, Our Lady of Presentation parish located in the Oak Square neighborhood of Brighton closed. 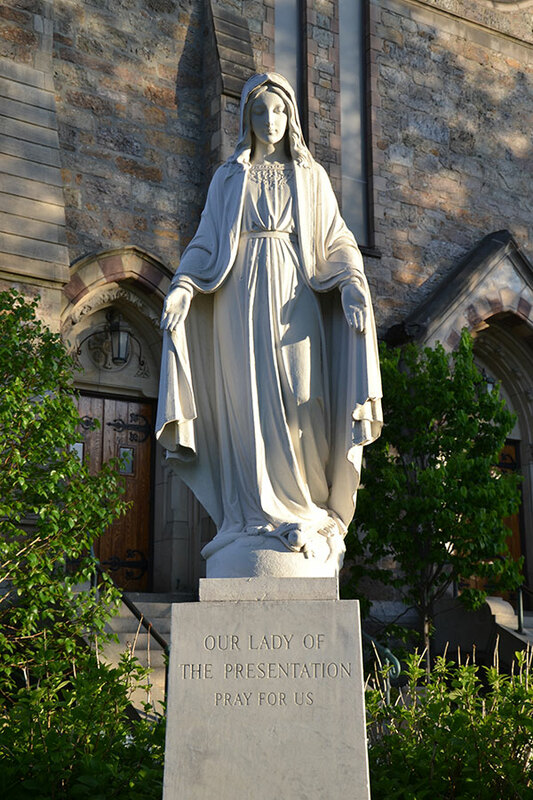 The statue of the Blessed Virgin Mary that currently sits in front of St. Columbkille once belonged to Our Lady of Presentation. 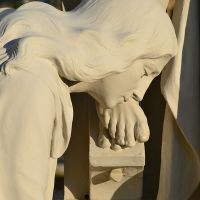 Having previously been damaged, this statue was beautifully restored by a Catholic benefactor who was impressed by the faith of Our Lady of Presentation’s parishioners. 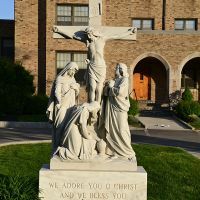 Now that they have become St. Columbkille’s parishioners, this statue serves as a tribute to Our Lady of Presentation parish and its people. Something similar occurred two years later, when in July of 2006 Msgr. William Fay became St. Columbkille’s 9th pastor. On the very day that this occurred, St. Gabriel’s parish in Brighton also closed. 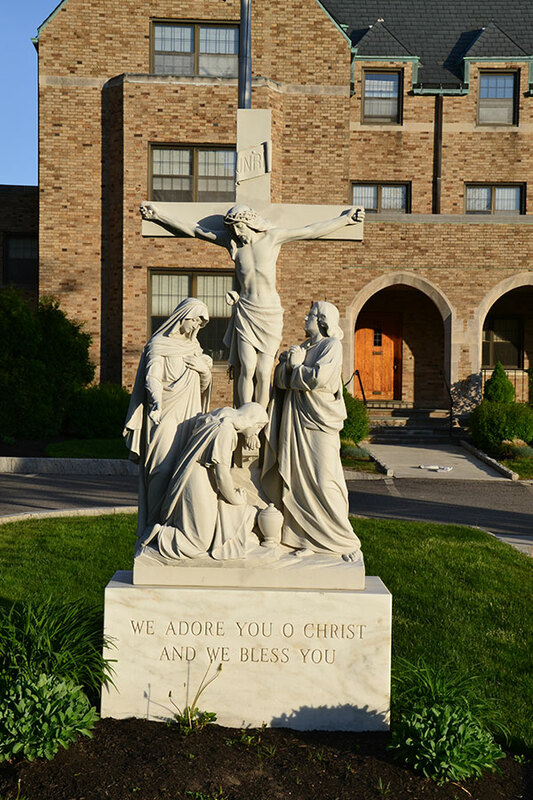 The statue of the cross in front of St. Columbkille’s rectory is a replica of the one that graced the interior of St. Gabriel’s and serves now as a yet another beautiful reminder of Brighton’s rich and storied Catholic past. Msgr. Fay made significant improvements to the outside entrance areas of the church property. Since July of 2013, Fr. Richard Fitzgerald has led St. Columbkille as its Administrator. His pastoral leadership has enlivened the parish. The new programs, new energy, new music, and new pastoral planning for which he has been responsible have encouraged many to return to and remain in the Church. At the same time, Fr. Fitzgerald’s efforts have made the “new evangelization” for Brighton’s “older” Catholics both real and vivacious. Renovations to the upper and lower churches have been in progress since the fall of 2013.